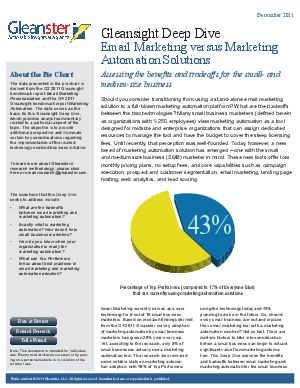 Learn how marketing automation differs from email marketing, where the overlaps are, and when it makes sense to move up. See a comprehensive comparison of core features, mapped to business purposes. Learn when, why and how top-performing organizations use marketing automation. Also included is "A Readiness Assessment" you can use as a smart guide to determine whether marketing automation is right for your business needs.